The last thread I found on this topic is almost 10 years old so thought it would be worth revisiting. I bought a set of tinted side glass that looks pretty good but has a patina of minor pits, scratches and scale you might expect from 50 year old glass. They'll need to be polished before I can use them. Anyone done this or have any suggestions or tips? There are lots of YouTube videos and other sources that make it look easy, but it's always nice to get help from people you trust and aren't trying to sell you something. I bought the glass polishing kit from 914 rubber. Haven't used it yet but I expect it will work well. I bought a few hundred dollars worth of polishing supplies to try and fix some side windows. I didn't have any luck getting the long vertical scratches out. They were just too deep. Hope you have better luck. If you can feel the scratch with your fingernail, it will not polish out! I asked a glass shop a few years back and they said that if your nail catches through the scratch, there is nothing to be done. I'm guessing mine will be a mixed bag. The windows are covered with permanent water spots that give the whole glass a haze. I assume polishing will remove that and this alone will make the windows a big improvement over my deeply scratched and clear originals. Almost all of the scratches are from glass sliding against gritty or worn seals so will be hidden behind seals when the windows are up. Some are probably deep enough they won't come out, but most don't catch a nail. The passenger side has some pitting from someone grinding metal too close to the unprotected glass. I was able to clean the slag out easily with a razor blade and what is left looks like typical road rash on an old windshield. Hopefully, the majority of those can polish out but I doubt I'll get 100%. Before you get into polishing for water spots, try 00 steel wool and glass cleaner. Takes some pressure, but that's my go-to technique for cleaning glass. It seems counter-intuitive, but the steel wool won't scratch the glass. You guys sure that's "00" steel wool and not "0000" steel wool? I saw a video with this subject too some time back and I thought it was "0000". I'll look for it again when I get a chance, but there is going to be some difference in the two and one of them may cause more damage than it fixes. I wouldn’t use any steel wool! Try cerium powder mixture w/water and a buffer. You can goggle it you’ll find a number of companies with kits and it works if not badly scratched. Now if deep enough to feel with your finger nail it’s not likely to work without altering the thickness of the glass and distortion would show. Steel wool may lightly scratch to a point that night driving could give you that glaring afect from on coming lights. I have early tinted side glass with areas of scratches. 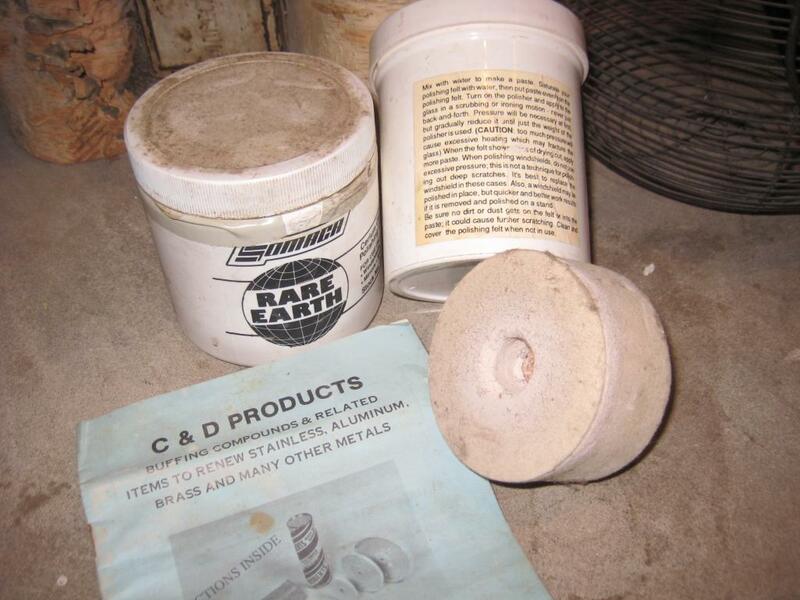 I used a kit that included rare earth , instructions and a proper polishing wheel. Maybe it can be done but no luck for me. I bought Cerium Oxide Polishing Powder and a small buffing wheel. I have not been able to try it but was told a slurry of this/paste plus high RPM may help reduce the scratches. The Colgate toothpaste works wonders on plastic headlights, not sure how it works on glass. They are I think all cerium oxide and a hard felt buff. Given patience they will drill through the glass in a couple decades. Really good for haze or chemical film. Not so good a t scratches. If you started with diamond grit and worked your way through the mesh sizes evenly then even pretty deep scratches would come out. But these are the final step, so material removal is slow. On the plus side, the finish they do produce is pretty nice. I wouldn’t use any steel wool! Whoa! (IMG:style_emoticons/default/blink.gif) That's a strongly emphasized statement for something you obviously haven't tried. I have probably over 100 hours of scrubbing glass with steel wool. And you know why I keep doing it? Cause it f-ing works... (IMG:style_emoticons/default/dry.gif) In fact, I don't even KNOW my steel wool is 00. I have 00, 000, 0000 and I grab whichever one I find first. Sorry Mark surly didn’t mean to ruffle any feathers! My experience years back used steel wool/water to remove a small scrach on a 78 Ford outside rear view mirror and scratches were hunting me on till I finally replaced it. Possibly cheep glass but a Ford mirror. I had used steel wool on house windows to clean light paint over spray and work well though never tried on any automotive glass again. .. In fact, I don't even KNOW my steel wool is 00. I have 00, 000, 0000 and I grab whichever one I find first. That's good info, right there. Cerium oxide to polish out fine scratches. Deep scratches can be done, I have done it, and it is a TON of work. I did an early Ghia that had very bad scratches everywhere. I tried all sorts of materials, some made things worse but I did find a working solution. 6 inch pad with wet/dry paper, the starting grit depending on how deep the scratch is. You must have water running over the glass at all times to keep the temp down. As with anything you keep going to finer and finer grits and then you finish off with the cerium oxide. You must pull the glass and set up a table with the set water supply. It is a lot of work. My Ghia glass is very rare and expensive so it was worth the hundreds hours invested. Do not use a hammer.